Hi, I’m Roy Coleman, a DIO Senior Estate Surveyor. 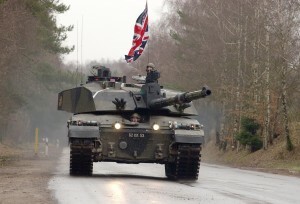 I’m based in Germany and currently working on the military withdrawal from bases in Germany to return to the UK under the Army 2020 plan. As the British Forces Germany (BFG) Drawdown Programme continues to gather pace, we’ve seen a number of significant milestones of late. Hameln may be best known for the famous story of the Pied Piper, but it has also been home to a British Army garrison for almost 70 years. 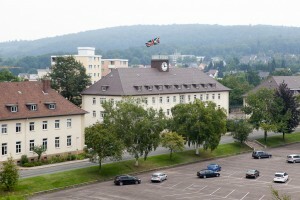 This ended in November 2014 when Gordon Barracks, the final piece of the Federal Real Estate in Hameln Station, was handed back to the German office for the Federal Estate (BlmA). Lt Col Ian Scrivens, Quartermaster of 28 Royal Engineer Regiment, locked the main entrance front gate to the barracks for the final time and handed over the keys to the representative of BlmA. This was the conclusion of a challenging piece of work for the DIO Land Management Services (LMS) Team in Germany, which has handed back not only Hameln Station but also its outlying areas of Rinteln and Bückeburg. In the 1990s, Hameln Garrison had a population of 3,500 British Forces personnel, their families and support staff. This number has been steadily reducing as we prepared to leave the station for the last time. The DIO real estate hand back programme was managed as a phased activity, and secured the controlled release of a number of assets back to the German authorities and private landlords. These included training areas, two schools, communication towers, sports facilities and a couple of shops. It’s not just the actual military buildings and estate that we returned when we left. All these soldiers and their families had to live somewhere, so once they left we returned over 200 Service Family Accommodation homes (SFA) in Hameln, Rinteln and Bückeburg to the German authorities. We also returned 168 privately-leased houses and flats to their landlords. The release of the leased estate in Hameln, which comprised of Service Families Accommodation and a commercial shop and storage unit used by the NAAFI (Naval, Army and Air Force Institutes) should generate an annual saving for Defence in excess of €2m. Of course, there are also further savings from no longer having to maintain the buildings or paying utility costs. The returned leased estate will now be re-let on the open market. The local population has always been interested in occupying surplus Service Family Accommodation so they should be happy! BlmA will decide on the future use of the federally owned estate and market it accordingly. Some of the buildings saw improvements which were funded by the Ministry of Defence for the benefit of the Army. In the event that a continued use is secured, DIO should receive extra income from the sale. The delivery of this piece of work was achieved by a continued team effort within DIO Europe. Our customer interface will enable DIO to continue to support the British Forces Germany Drawdown Programme through the next few years, to bring the project to fruition. It’s a big job, but I believe we’re up to the challenge. Cool, my photo of the HQ and Officers Mess! Hope that's ok! It was sent to us by the team there. Hi Arnd, that link is broken unfortunately. It says no content has been uploaded. I loved my time in Hameln, I lived in Jahn Strasse from Feb 84 until Aug 85. I think living in Germany made me grow up a lot! And thank god for the med centre, you saved mine and my son's life! Myself and family have just returned from hameln after a short visit after nearly 30years. Shocked to find the military had gone!! Hameln however was as beautiful as i remember. We also lived in jahnstrasse in 1982 for 7yrs. I arrived at Gordon barracks in december 1967 to join the REME light aid dept as a craftsman electrician, it was snowing hard .The town of Hameln was lovely, very clean streets and nice architecture.I used to kayak on the river Weser in my time off. There was a pub overlooking the river called the "Weser Terressen", although my spelling might be amiss. I used to sit with a drink and watch the night flotation exercises, happy days. unfortunately I was posted to Bahrein (as it was spelt then ) after only one year. I also remember "Georges " the pub opposite the barracks that was out of bounds to squaddies but was full of them every night ! I was posted to Hameln in the summer of 1947 and remained until Christmas 1948. My troop was 1 and 51 Plant Troop attached to Engineer Training Establishment. I was Captain Penistan's driver. I am now 90 years old, and still have fond memories of my time in Hameln.